Whether you're an advanced user or a novice, it's the perfect time to learn about benchmarking. So many easy-to-use, powerful, and inexpensive programs are out there that you’re bound to find one or more that tickle your fancy. Achieving fluency with these tools takes little time, and playing with them is surprisingly fun. Along the way you'll pick up some technical knowledge, and you'll get to know your system's in and outs like a pro. Benchmarking can be an entertaining way to keep abreast of what's going on in the world of computer hardware, too. Some people enjoy exploring the cutting-edge 3D engines that some gaming benchmarks employ, while others take their custom-painted, liquid-cooled, neon-lit rigs into speed competitions with all the intensity of an actual auto race. The suites in this roundup are among the most popular you'll see today--you've probably heard of a few. It's a big list, with a little something for everyone. 3DMark has had its ups and downs over the years, but it remains the go-to source for synthetic gaming benchmarks. You can find a separate version for each flavor of DirectX from version 9 onward (3DMark 06, 3DMark Vantage, and 3DMark 11), and each version has its own section in vendor Futuremark's online database. Advanced versions with additional features are available for a price ($10 to $40, depending on the software), but the free Basic versions suffice for most needs. 3DMark 11 looks ahead performance-wise, kneecapping most modern computers (resulting in frame rates in the teens), but I prefer 3DMark 06 from a stylistic standpoint. The older suite feels better crafted than its successors, although its days as a mainstream tool are drawing to close. The three separate sizable installs add up, however. Futuremark buries you in over 1.2GB of data downloads if you want a complete set of numbers, and requires considerably more space fully installed. Sheesh. For a more reasonably sized, if less complete, set of gaming and DirectX numbers, try Unigine Heaven. Heaven's sandbox nature is a revelation in synthetic benchmarks. It’s a hoot to click out of the preset paths and explore the environment, moving the camera with gaming-standard WASD keyboard controls. On top of that, Heaven may be the best-looking DX11 benchmark around--some of the views are stunning. The basic version is free. On the opposite end of the spectrum is the dowdy, bespectacled Prime95 (available in 32-bit and 64-bit versions), which is disguised as an innocent mathematical research program. Don't be fooled: It's nothing less than a cattle prod for your CPU. The free utility is well known in the performance-computing community, as system builders typically test their CPU, memory, and overclock settings with Prime95 by running the built-in stress test for a few cycles. If you have issues with your hardware, or if your cooling isn't up to snuff, you'll find out in short order. In addition to catering to gamers, Futuremark is appealing to mainstream users with PCMark. Though the previous version had some issues with Windows Vista, PCMark 7 manages to be a credible, modern re-creation of the desktop-performance benchmarks so popular in the '90s. It skirts some of the criticisms leveled at synthetic benchmarks by using code snippets from popular commercial applications, and by timing the execution of prescripted procedures to run through them. As the name implies, though, it's for Windows 7 only. The basic edition is free. Among system-wide benchmarks, Passmark's Performance Test 7 (for 32-bit and 64-bit systems) is the respectable child of the family--it went to school and got good grades, and it wears a neatly tailored suit. The 3D tests in this tool show you sober models of jets and evergreens, which is something of a relief after all the roaring dragons, battling spaceships, and whatnot featured elsewhere. Conceptwise, it mixes and matches some of the best ideas from all the packages here. You'll find no free version, however; Passmark offers just a free 30-day trial for this $24 program. On the other hand, SiSoftware's Sandra does have a free version, and it includes all benchmarking features. Although the tool is occasionally obscure, Sandra's long and winding history has led to a pretty useful comprehensive benchmarking and system-information package. If you like your benchmarks with an extra helping of utility, this is the one to pick. Reminiscent of Sandra but with a more accessible interface, AIDA64 doesn't do quite as much overall, but it does feature an excellent set of focused CPU/memory benchmarks. Take your pick of either package, the $40 AIDA 64 Extreme Edition (for personal use) or the $80 AIDA64 Business Edition (for commercial use)--you won't be disappointed. The free download is only a limited trial, though. After dealing with the bloat of some of the larger packages, you have to love a benchmark as quick, simple, and tiny as the free CrystalDiskMark. It's the smallest program here. You'll know how to use it the second you set eyes on the interface. No need to wade through menus or 25-minute processing queues, either--a few clicks, a few seconds, and you're done. 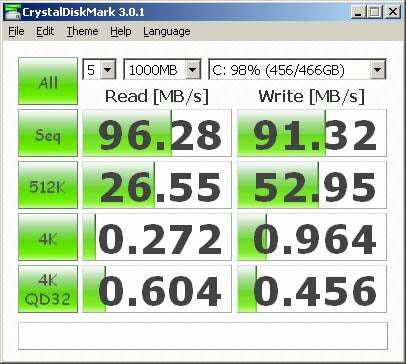 That's truly refreshing among disk benchmarks. The tool doesn't do anything else, but it doesn't have to. Fraps was created with the same philosophy. It sits atop any game and displays the frame rate in the upper-right corner of your screen. The free demo is perfectly functional, though the $37 professional version can also take screenshots, record gameplay video, and more. It may sound simple, but Fraps doesn't get half the kudos it deserves. While flashy synthetic benchmarks attract all the attention, Fraps shoulders the workaday burden of providing trusted, real-world results from the actual games that people play, and it has been doing so for years. Even if you use another benchmark, this one is essential if you're a gamer. If you decide to give some of these suites a try, remember a couple of basics: Don't run any background applications while you're using a benchmark, and try to keep the computing environment consistent between runs. For example, if you're using Fraps to determine your frame rate in a game, stick with the same saved game files for testing, and don't move the mouse after loading. Still curious about what a benchmark will tell you about your system? Time to take a crack at it. Pick a few apps, and get the ball rolling. You'll be surprised at what you learn.